Apples of Gold Jewelry brings you another beautiful pair of gemstone earrings with these ruby and white gold gemstone stud earrings. The bright, vibrant red of the ruby gemstones, which are authentic and AA rated for quality, are held in place on a 14K white gold setting. The friction push back closure design is a great way to ensure your earrings stay in place, and the beautiful 2.5mm round ruby stone is sure to grab extra attention! 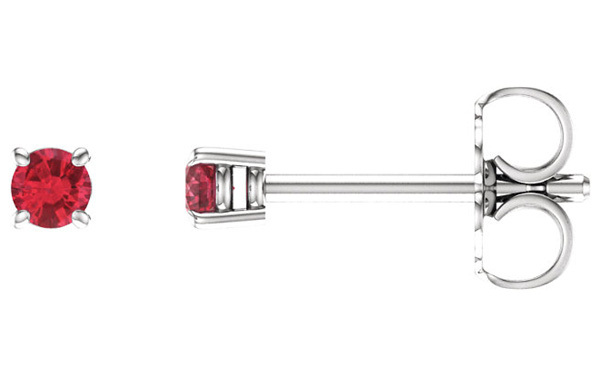 We guarantee our 2.5mm Ruby Stud Earrings, 14K White Gold to be high quality, authentic jewelry, as described above.